Look, as much as it stings to say so, it might be time to stop anticipating the arrival of that truly great video-game adaptation on the big screen. Assassin's Creed, the long-awaited cinematic take on Ubisoft's continuing franchise, has just about everything going for it to finally get the job done: a promising new director in Justin Kurzel, who delivered a flawed but beautiful adaptation of Shakespeare's Macbeth; a cast led by several Oscar winners and nominees; and a science-fiction setup that's almost ready-made for a Hollywood blockbuster, one that transports the lead character into virtual-reality journeys throughout invigorating historical events. Coupled with the series' clandestine stealth combat and novel pop-science involving the "memory" of DNA, this one really had the opportunity to scale over the wall that's separated the two mediums for many years. Alas, despite a strong grasp on the game's visual language and credible performance value throughout, storytelling once again delivers a killing blow to this muddled and occasionally sluggish adaptation. Assassin's Creed doesn't pull directly from any of the games in the series, instead telling a brand-new story set in a tweaked version of Ubisoft's game universe, penned by Macbeth's Michael Lesslie alongside the duo of Bill Collage and Adam Cooper responsible for Allegiant and Exodus: Gods and Kings. The lead character, Callum Lynch (Michael Fassbender), is also newly created for the film, a late-thirties man on death row with a scarring past involving death in his family. Instead of meeting his end, he awakens in the depths of a high-tech facility owned by Abstergo, a science research corporation with a project dedicated to tapping into ancestral memories found within people's DNA, overseen and owned by Alan Rikkin (Jeremy Irons). Their interest in Callum has to do with his lineage, which becomes clear as he's strapped into an elaborate virtual-reality device, the Animus, and begins to live out the memories of Aguilar, a member of the Order of Assassins who furthered their pursuit of the Apple of Eden -- I know, bear with me -- in late-1400s Spain. It's this Apple of Eden, an ancient relic that manipulates the free will of others, that Abstergo, the corporate face of the Templars, hopes to locate in the modern era. The juxtaposition of the slate-colored, sharp-angled Abstergo facility and the dusty earthiness of those sequences from historical Spain reveals that director Kurzel and his crew truly grasp how Assassin's Creed should look and feel. Granted, they've made changes to better suit the live-action medium, notably how they've turned the Animus device -- essentially a stationary VR rig in the games -- into a large, funky robotic-armed contraption that tracks Callum's real-time movements during the memories, which actually gives the lead actor something to do in the present era besides just lying down; think The Matrix. When it comes to the transitions from the prison-like facility to the eagle-eye soaring glimpses of the landscapes navigated by Aguilar and his brothers and sisters in arms, and when it comes to the fast-paced chases and combat that occur throughout the buildings and cramped streets of late-1400s Spain, this film truly encapsulates the attitude of the franchise. As with Macbeth, the lived-in textures and architecture are stunningly cohesive with the setting. When it comes to focusing on the characters, however, I suspect this new take on Assassin's Creed, a largely stone-faced and solemn affair, might have looked to the wrong installment in the game series as a point of reference. The first Assassin's Creed game may have gotten things moving, establishing the historical lore and the science and the assassination aspects, but there are certain elements that were "fixed" in its sequel that transformed the series into something a bit more enduring ... and the big one was introducing a second protagonist with a stronger personality than the first, someone with levity and exuberance. Callum Lynch didn't get that message, and neither did his historical counterpart, Aguilar: despite Michael Fassbender's chiseled, brooding features conveying the actor's signature depth and tragic tone, there aren't any breaks from the dark cloud hovering above him in either the past or the present. Fassbender is reliably solid, but perhaps too solid when surrounded by so much ill-omened conspiracy and death, all taken too seriously. It doesn't help that Assassin's Creed abruptly hurls the audience into Callum's life, the functions of the enigmatic Order of Assassins, and the workings of the Abstergo facility -- with Kurzel's Lady Macbeth, an enigmatic and polished Marion Cotillard, as the scientist brains behind the project -- while the explanations that do drop into the film are the burdensome info-dump variety. The script suffers an anticipated but unfortunate fate for a video-game adaptation with a big narrative, cramming too much material into a short amount of time while still concentrating on producing an engaging action movie, which leaves the story lagging behind while the time-alternating thrills sprint forward. Director Kurzel takes a valiant stab at sorting out the intentionally jumbled chronology between the past and the present, elevated by the talents of Charlotte Rampling, Brendan Gleeson, and Michael Kenneth Williams in roles spread across both the Assassins and the Knights Templar; however, beyond the rudiments of the search for the Apple of Eden and what it accomplishes, the sluggish, perplexing rhythm of the messy exposition undercuts its suspense. As it progresses, Assassin's Creed yearns for the audience to grasp on messages about the balance between order versus chaos, control versus free will, while deciphering all the pieces of the puzzle scattered throughout Justin Kurzel's meticulously-crafted visuals and action. The ambition for this to become something bigger than the run-of-the-mill video-game movie can be clearly observed, yet the film cannot get in sync with that potential, unable to legitimize the preposterous sci-fantasy components enough to achieve that deeper impact. 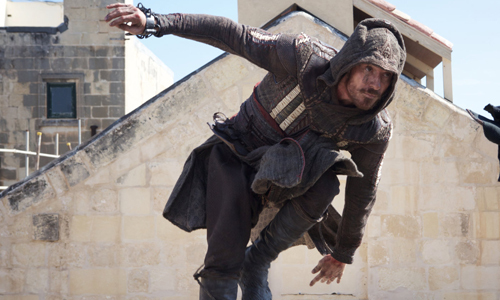 Instead, it delivers cursory entertainment with the tight, well-shot martial arts combat and the cat-and-mouse chases that have come to hallmark the Assassin's Creed franchise, with everything else being just coherent enough to make sense of where the film's ultimately headed and just convoluted enough to stay uninvested in the proceedings. For the pedigree of talent involved, it certainly was permitted to accomplish more than that.